Rick Carter, Bob Gale, Tim Dowling and Christpher Lloyd after the screening. 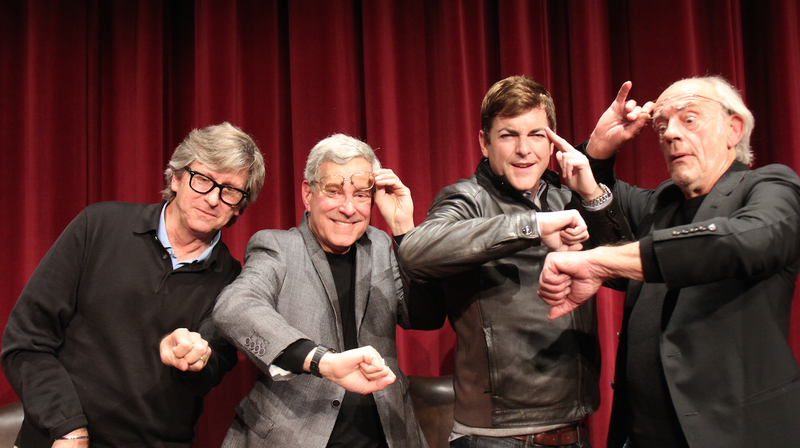 Gale and Zemeckis met while undergrads at the USC School of Cinematic Arts and began trying to develop an idea for a time travel movie while making student films together. The script took on several versions and was passed over by several studios until Zemeckis directed Romancing the Stone and had enough heat to produce the ambitious script. In addition to being the thirtieth anniversary of the time travel comedy, 2015 is also the setting for the future-set Back to the Future Part II. Bob Gale and Robert Zemeckis were nominated for the Academy Award for the screenplay of Back to the Future and have worked together on several films including 1941, I Wanna Hold Your Hand, Used Cars, and Trespass. Christopher Lloyd is also a long-time collaborator of Zemeckis, having appeared in the Back to the Future trilogy and Who Framed Roger Rabbit? Lloyd is best known for his films with Zemeckis and the iconic sitcom Taxi. Carter’s production design can be seen in the upcoming Star Wars: The Force Awakens.